This is curious though – a slumping economy, high unemployment, and law enforcement agencies strapped for cash wouldn’t seem to be the ideal recipe for this soup. Much has already been said about what causes crime – just google “why is crime down” for a line up of groups ready to take credit or advance their theory (lead exposure?). But I wonder whether the answer lies in comparing crime rate changes in different places. 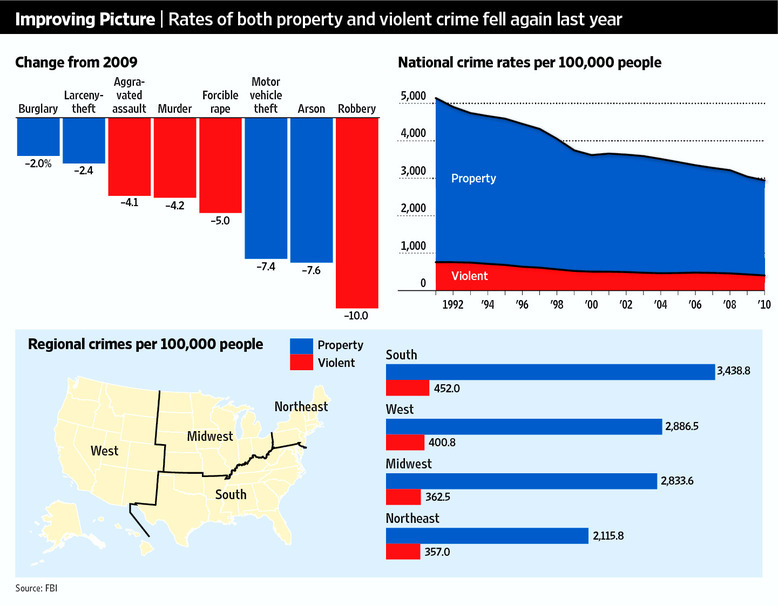 Take North Dakota, which posted double digit improvements in both property crime and violent crime in 2010. What changed in North Dakota that didn’t also change in, say, New Hampshire, which saw increases in both types of crime this past year? Hi Ben, nice visualisation. How did you include the image in the background?